Around the holidays last year, Nai asked me to make a very special gift for her girlfriend Michelle. 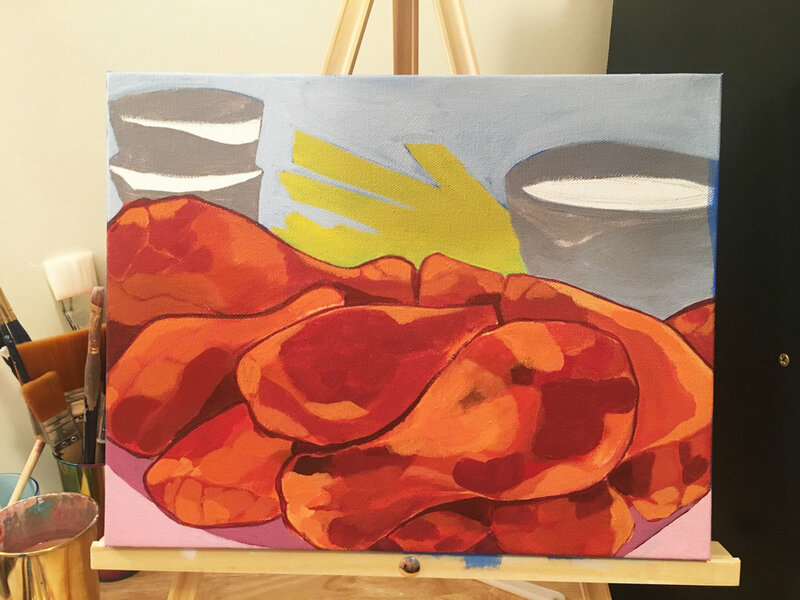 She and Michelle share a love of wings so naturally that was the subject of choice for her custom painting. Nai told me exactly how they like their wings: with extra celery and extra blue cheese so I made sure to add those details so they could always look at their painting and think of their favorite times spent together sharing their favorite food! First we started with the perfect, mouth-watering reference photos. Finally, I added the last layers with highlights and some scallions. Then it was ready for pick up! Then the best part, it gets to live in its new home and remind Nai and Michelle of their happiest moments together! It was the perfect unique and meaningful gift for the holidays. Thank you, Nai and Michelle, for letting me create something so special for your home! To start your own custom painting to capture your favorite food memory, click the button below.